"If it ain't fun to do, it ain't worth doing." He says that nothing frightens him, except when he looks in the mirror. He thinks that everything is a big joke and acts accordingly, even during battle. Goofy, irreverent, sometimes annoying... but a top-notch warrior. 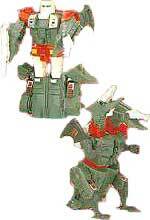 In robot mode, wields a vaporator which gassifies a target's fuel, leaving it inopertive. In creature mode, has indestructible tusks. Flies at 45 mph, can leap 3 miles at a time. "Decepticon destruction is my favorite sport... and mine, too." Can't be depended on -- can't even depend on himself, since he has two minds and they never agree on anything. A deal made with one mind won't necessarily bind the other to act accordingly. Ferocious, savage, hisses when he talks. In creature mode, flies at 80 mph, has razor-sharp teeth. In robot mode, uses rust-ray rifle to corrode enemy robots. He has a personality as repellent as his looks -- been kicked out of the Autobots many times for insubordination only to be asked back since he's always willing to undertake missions too low-down and dirty for anyone else to consider. In robot mode, carries venom laser that slows cerebro impulses and paralyzes on impact. In creature mode, has infra-red and X-ray vision; can emit colors and stroboscopic effect with eyes. Claws contain chemical, electromagnetic and audio sensors; can rip through almost any substance.